Garden Motifs [C5515] - $12.00 : Yarn Tree, Your wholesale source for cross stitch supplies. Cross stitch pattern from Tiny Modernist. Plant a seed & watch it grow! Dirt, water, sun & flowers, welcome to the garden! As you take a walk through the garden, enjoy the flowers blooming, vegetables sprouting & the aromatic smell of the herbs. Don't forget your water can, small garden spade & boots! Butterflies flutter, ladybugs crawl & birds fly. Also included is the pattern for the "Bees and Butterflies Welcome." 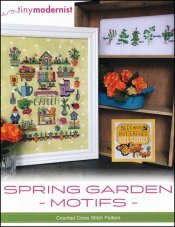 See you in the garden, with your stitching in hand! Stitch counts: Butterflies Welcome Design is 40H x 40W & Herbs Design is 30H x 117W.